MuST programmes are conducted by YES-J for unorganized sectoral students. 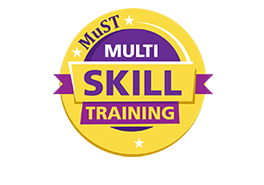 Multi Skill Training camps are mainly a fun way of learning for the students where different methods are adopted to improve their vocational skills & develop their personality. Most of the camps are residential programmes and offer free food and lodging to the participants. Through the training camps, underprivileged young people are encouraged to learn vocational skills like repairing electronic appliances, professional welding, driving, tailoring etc. which enhances the participants' capacity to undertake self-employment and also increases their access to employment with a stable salary. Besides acquiring a skill, the participants of MuST programmes are also helped to build their confidence, innate talents, skills and qualities through faith formation, motivational talks, games and other extracurricular activities. On the final day of training, the participants receive skill training certificates. Take a look at the impact of MuST till 2018.
young boys and girls have undergone one-month to three-months long training since 2016.
deserving youth will complete3-month Driving and Mechanical Training for the year 2018-19. "This is the first time I have stepped out of my village. So happy to know the world outside and also to learn the skill of welding." "The MuST camp has made me realize that I too can dream big."